Nothing quite makes me say, “you’re full of it” like the Sunday Life magazine’s 'My Day on a Plate' section in The Sunday Age. If you're unfamiliar with this ode to the human species’ ability to lie, it basically asks a notable person to report what they eat over a day, after which a nutritionist analyses their incredibly healthy habits. The system is clearly flawed. If Sunday Life really wanted an honest report, they would install a number of cameras around said individual’s home and workplace and then proceed to bug their clothes and mobile phones, which, as we have seen from News of the World, is possible, but may see you arrested. The result is an embellished dietary journal that causes readers to have two dangerous thoughts: firstly, that the sort of eating patterns reported are commonplace and secondly, that they probably shouldn’t have had that oversized kebab with extra tahina last night. What a load of poppycock. Hardly anyone, especially not busy people, actually drink a few litres of water a day. Okay, so we're meant to, but we just don’t. And the soy latte? Soy milk increases your chances of breast cancer, you know. Any healthy person absolutely must chuck quinoa in there somewhere, after all, it’s a ‘miracle’ food (half of you are currently thinking, 'what the hell is quinoa?'). I also love how at 7.30am, Bec chooses to “ignore the pastries in the greenroom” and snack on a grain toast sandwich (heaven forbid a white sourdough) or some fruit (excluding dry fruit, it has too much sugar). If she’s ignoring the pastries, it obviously means she’s seen them, which in turn means she has snacked on their buttery, fatty, crumbly goodness at least once in the past… she just hasn’t on this particular day because she has to report back to Sunday Life with a food journal. Then there is lunch. Puh-lease! Somebody enlighten me as to what is so “standard” about Bec's “standard combo” of tuna, veggies, brown rice and feta (the last of which hardly complements her meal). By now, we think this lady is super human. So just to make us think she might be on our planet, she throws in a yarn about snacking on birthday cake in the office once in a while. Of course the nutritionist at this point usually says something like “it’s great to see that Bec isn’t too strict with her diet and allows some room for enjoyment once in a while.” Then it’s sashimi and miso around 7pm (which is dinner time for the rest of us). Sashimi is fish (I wonder how much bacteria is sprouting on it by 7pm?). Miso is salty water. THAT AIN’T FILLING. Yet there is a notable absence of food for the rest of the evening, despite her busy schedule. It’s all ‘a few glasses of wine’ and a cuppa (herbal, of course). Excuse me while I segway for a moment. Usually I criticise people for writing the acronym ‘LOL’. It's overused and when you think about it, people only LOL when they write LOL 2% of the time, and that is a scientific fact*. Well Marieke Hardy makes me LOL. She took a playful stab at the My Day on a Plate section towards the end of last year in the same magazine that publishes it. In her ‘guide to vices’ column last week (29/1/2012), she covered the theme of overeating and basically declared that it’s not evil. It is after reading her column that I have been inspired to share with you my day on a plate, or more accurately, my day on a platter. In a family of boys presided over by a mother whom, like her daughter, has no self control when it comes to eating, we eat a lot. As a food blogger, it’s a no brainer that my passion is eating. People often say to me, ‘how do you stay so skinny when you eat so much?’ and I frequently read that you live longer if you eat smaller portions. Screw that! I enjoy the feeling of being over-satiated. I adore starving myself for a day if I know a buffet awaits me in the afternoon. I dream of rolling out of restaurants hand on tummy, caressing my food baby. I deliberately wear a loose dress if I’m going out for a meal, not too look nice, but to accommodate the rounded bludge where my flat stomach was an hour earlier. Yet apparently the other secret to a long life is experiencing happiness. If gorging myself like a gluttonous 19th century king makes me happy, then perhaps I will live longer than the people who stick to the rule that a serve of protein should be no bigger than your palm. But that doesn’t mean I do it every day. While the saying purports “everything in moderation” I interpret that to mean stuffing yourself like a Christmas turkey is okay in moderation, too. 11am: Mum brews an espresso on the coffee machine. I pour it over ice until it’s cold and then fill the glass with FULL FAT milk. Finally, I add two scoops of vanilla ice cream. Ta da! Iced coffee! 12pm: My first meal of the day is at lunchtime, what of it? I know it’s unhealthy, but by the time the family are awake on Sunday, it’s midday. We eat homemade bircher muesli with Greek yoghurt, grated apple, soaked raisins and honey. We eat plates upon plates of poffertjes (mini Dutch pancakes) drowned in powdered sugar and lemon. I have two glasses of water, my first and last of the day. 4pm: I’ve just realised I’m bloody hungry, but I’ll ruin my dinner if I eat. I ignore my grumbling stomach and stick it out — no point ruining dinner. 6.30pm: A big, fat, juicy burger for dinner from Huxtaburger, a new diner-style burger joint in Fitzroy. I drool over the beef pattie, mustard, mayo, tomato sauce, sliced tomato, melted cheese, lettuce and pickles on a sugary, glazed bun. Don’t forget the large deep-fried, crinkle cut chips. I have a sip of someone else’s cider before throwing an organic ginger beer into the mix. It tricks my body into feeling healthy. Ginger is cleansing, right? 7pm: We consider getting take-away gözleme from the place that does them so well on the corner, but decide that’s being piggy. 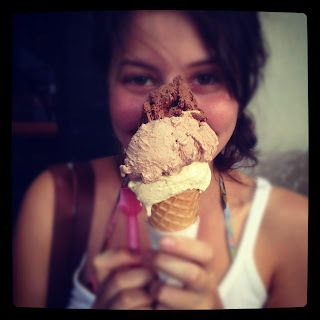 Instead, we opt for ice cream from Gelobar in Brunswick East. I always fancy the fruity sorbets, until I see the sweeter options. I order a waffle cone with three scoops: chocolate, Ferrero Rocher and crème caramel. I don’t love waffle cones so I throw it out, I just wanted to get three flavours and a cup was more expensive. 8pm: I have a few squares of dark Lindt chocolate and two slices of watermelon. 9pm: I sip on a green tea while watching the tennis. 11pm: Still hungry, but think I'll go to bed soon. 1.30am: Novak Djokovic takes a bite of banana on screen for energy. I want one but resist. 2am: the 6 hour match finally finishes. I go to bed, utterly starving. It is one day and it doesn’t reflect my entire life, a disclaimer most people seem to forget when reading Sunday Life's My Day on a Plate. My meal times were rubbish; the food was salty, fatty and lacking in adequate nutrients; and as a consequence I had a fabulous day. It was an exception, not the rule. I tend to eat healthily most of the time, but I have some something naughty almost every day. Sure, some days I’ll have a fruit salad and yoghurt for breakfast, followed by a tuna salad for lunch and then chicken skewers with brussel sprouts and baked sweet potato for dinner. In an ideal world, that’s where it ends. But you’re in my world, and by then the inevitable happens… As expected after a day of eating like an anorexic rabbit, I’m FUNGRY. I continue with two slices of challah, a sweet Jewish egg bread renowned for being unhealthy) with mountains of butter. It’s frigging delicious, so I cut another half slice, butter it, and devour it. Then, after fooling myself for approximately 30 seconds, I grab the other half and repeat. By now I’ve lost any ounce of self-control I had left. I’ve ruined my healthy day, so why not have two bowls of ice cream covered in Milo with Maltesers on top? Having a good metabolism and thin parents is certainly an advantage when it comes to regularly eating like a bear before hibernation. But there’s more to it than that. I hardly drink alcohol, aside from the odd glass of wine, and I don’t eat fast food. In fact, last time I had MacDonalds was in Germany in 2009 while backpacking through Europe on a budget**. I also don’t snack much between meals and there is always healthy food available in the fridge and cupboard for when I do (grain crackers, nuts, fruit). That being said, we also have a chocolate basket full of individually wrapped Crunchies and Flakes and my brother works at Lindt and is constantly bringing home goodies. I used to be able to get away with eating anything, but now I do spin classes at least three times a week and have rediscovered yoga. I don’t like exercise, but if it allows me some leeway with what I eat, then by God, I’ll do it. * It’s not scientifically proven, I lied. ** When I returned from this particular trip, the family went for dinner at my grandparents’ apartment. I walked in the door and instead of a big warm hug, my grandpa greeted me with a blunt, “you’ve put on weight.” I was 8kg heavier. Great post! So spot on about those My Day on a Plate entries. Cheers Yaz! I think everyone should be able to have their cake and eat it too... literally! Sofia, I told you MANY MANY times, you are bloody Funny, F*unny LOL. Just like your Fungry! Thanks for sharing your usual Sunday with us. I don't think I can ever do what you did again. My tummy is bloody 5 months pregnant! And ready to breast feeding too! Love this post and agree with you about how annoying that column is. Why don't they get any people who eat normally on there. It is truly hilarious. Much prefer reading about your day on a plate! Cheers for the kind words! That's a good idea actually. Perhaps I can publish a few 'naughty' My Day on a Plate examples, if anyone has some they want to share? So glad you enjoyed the read, Sarah! Thanks so much : ). 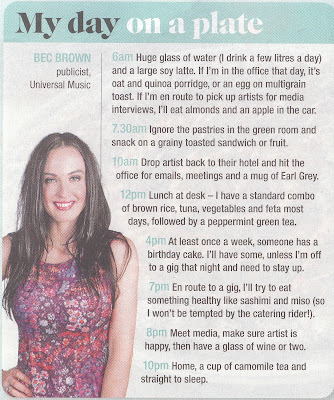 So I'm Bec, aka 'day on a plate' girl. Trust me, I LOVE food. I've tried only eating the high-carb, delicious white and/or chocolately goodness type foods. I've also tried eating sporadically through the day with no pattern. I've also gone for days on apples and wine. But after maybe two of them in a row, those days always make me fall in a heap and then I can't function to do all the things that I want to do. And that doesn't make me happy. Anyway, thanks for the laugh and look forward to reading your other fabulous posts. Can't help but chuckle that you came across this post! Thanks so much for reading and having a laugh instead of a go, would have been very easy to do the latter seeing how cheeky I was in this post! I completely admire your ability to eat as healthily as you do, and I am glad it makes you feel fabulous. I think my weakness is my sweet tooth! Loved your holiday post. Mindful eating is something I'm actively trying to do every time I have a mouthful, whether it's some healthy quinoa or a big spoonful of chocolate mousse. At the end of the day, I think it's all about moderation. Whatever eating habits make someone happy, they should stick to! Thanks for being a great sport! Ha - you HAVE to laugh... (especially when you're funny). Thanks also for the general cafe tips btw - I was just in Melbs for work and went to Hobba for lunch - yum.